Welcome to Warhammer Quest – The Imperial Vault, our site dedicated to offering new content for Games Workshop’s dungeon-crawler game, Warhammer Quest. The Imperial Vault is for all of the extra Warhammer Quest rules, tables, cards and choices that the wider Warhammer Quest gaming community have written since ‘Quest was first published in 1995. Warhammer Quest is an amazing game, and the fact that so many fans are writing extra content for it – and a computer game for the iPad is planned for it – so many years after Games Workshop stopped supporting it is testament to the richness, depth and extensibility of the Warhammer Quest rules set and the wider Warhammer universe. 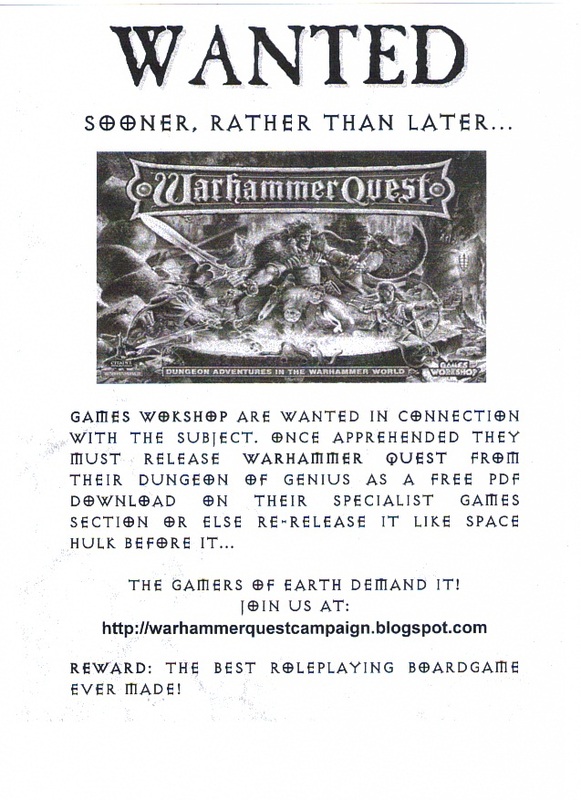 The content on this site was submitted by a community of Warhammer Quest players, so if you have any rules, board sections, events, hazards or anything else for the game you would like to share then share your Warhammer Quest ideas. No idea is too small, no project too ambitious! Equally, if there is something you would like to see added to the site then we want to know! Feel free to share your thoughts and comments on what you read using the Comments section found near the bottom of each page. New and updated Special Locations and Settlement Events to use between games of Warhammer Quest, to give a better ‘flavour’ of the Warhammer World. Leave your faithful steed at the Stables, or peruse lots of new items for sale at Special Locations and Traders like the Healer, the Weaponsmith and the General Store. Loads (126!) of new Dungeon Events to add to your Warhammer Quest Event tables. Check out the Dungeon Events random event tool! Piles of new Travelling Hazards to use in your games – we’ve clocked up 52 Hazards, helping to add variety and flavour to your games. Check out the Travelling Hazards random event tool as well! Please use the links at the top of the page and to the right to find your way around, and feel free to Contact Us if you have any feedback, requests or even Warhammer Quest articles and rules you would like to submit. Even the smallest rules are most welcome, the Event Generators are full of such small snippets! Until then, have a good look round and enjoy the site! A crowd of excited citizens, protesting at the increase in taxes proposed by the burgomeister and his officials, fill the streets as an impassable, jeering mob. Enter your email address to subscribe to Warhammer Quest: The Imperial Vault and receive notifications of new Warhammer Quest articles, rules, events and more.